CORSA Performance Exhausts are known for their quality and technology. Corsa Performance Exhausts are more than a pipe with a muffler. Each bend is meticulously analyzed and tested for both power and sound. Corsa offers multiple systems, such as the Corsa Sport Exhaust and Corsa Touring Exhaust that focus on a balance of these important factors. Aggressive Performance Sound: Corsa Exhausts are acoustically styled and engineered to match the harmonics specific to your exact vehicle. Each system, sport or touring, is designed to match the personality of a car and its owner while delivering superior power. No Drone: This is what sets Corsa Exhaust Systems apart from others. Corsa's RSC technology eliminates "problem" frequencies that cause interior drone/resonance at cruising speeds. Corsa is more than a pipe and a muffler! Improved Horsepower And Torque: Corsa's Patented non restrictive and Straight through design reduces back pressure and frees up additional power to get your vehicle moving faster. Potential For Improved Fuel Economy: Reduced back pressure and more power means your engine functions more efficiently and that translates into better fuel economy when accompanied with mellow driving habits. Premium Stainless Steel Construction: Corsa's combination of 304L stainless steel construction and the fact that Corsa Exhaust Systems use premium packaging and premium hangers ensure your product will last. Corsa is so confident your system will last, Corsa offers a Limited Lifetime Warranty on all of their exhaust systems. Ready to Bolt On: Corsa Exhaust Systems are ready to bolt on. All Necessary Hardware And Full Color Instructions are included. 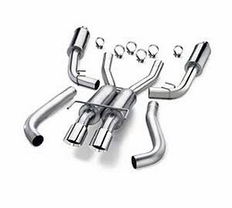 The part number for this Corsa Exhaust is: 14119 and it fits 1996-2002 Dodge Viper RT 8.0L V10 models. This Exhaust has a 3.0" diameter and Single 4.0" Polished tips.